Geraniol has a sweet, floral, fruity, rosy, waxy, citrus smell to it. The terpene has been known as a good mosquito repellent, but unfortunately attracts bees. Geraniol is toxic to bacteria and certain fugi. Further uses for the terpene include anti-inflammatory action. Also as a topical drug enhancer and anti-inflammatory, geraniol has proven useful. The effects of Geraniol on relieving pain were investigated in mice. Upon administration, geraniol significantly affected the number of Fos-positive cells in pain neuron sites in the brain, signifying an analgesic outcome. Preparation, Characterization, and Pharmacological Activity of Cymbopogon winterianus Jowitt ex Bor (Poaceae) Leaf Essential Oil of β-Cyclodextrin Inclusion Complexes. Geraniol was examined as a fungicide for Candida albicans. Administration of the compound inhibited pseudohyphae and chlamydoconidia formation of the fungus. In the time-dependent kill curve assay, fungicidal activity for MIC × 2 started at 2 h for the ATCC 76485 strain, and at 4 h for the LM-70 strain.. Investigating the antifungal activity and mechanism(s) of geraniol against Candida albicans strains. Protective antifungal activity of essential oils extracted from Buddleja perfoliata and Pelargonium graveolens against fungi isolated from stored grains. Antibacterial Investigation of Thyme Essential Oil and Its Main Constituents in Combination with Tetracycline. Sensitivity of pathogenic and commensal bacteria from the human colon to essential oils. Essential oils from aromatic herbs as antimicrobial agents. Plant-derived monoterpenes suppress hamster kidney cell 3-hydroxy-3-methylglutaryl coenzyme a reductase synthesis at the post-transcriptional level. Geraniol co-application with a couple topical drugs was concluded to enhance the skin penetration in delivering these medicines in mice. Influence of drug lipophilicity on terpenes as transdermal penetration enhancers. aminobisphosphonate alendronate and bacterial muramyldipeptide. Geraniol, and geranylgeraniol were effective in preventing the inflammation induced by alendronate-muramyldipeptide. This could be an effective treatment for mevalonate kinase deficiency. Natural isoprenoids are able to reduce inflammation in a mouse model of mevalonate kinase deficiency. Causes skin irritation and may cause an allergic skin reaction. Causes serious eye damage. Avoid breathing dust / fume / gas / mist / vapours / spray. Wash skin thoroughly after handling. Contaminated work clothing should not be allowed out of the workplace. Avoid release to the environment. Wear eye protection / face protection. IF ON SKIN: Wash with plenty of soap and water. IF IN EYES: Rinse cautiously with water for several minutes. Remove contact lenses, if present and easy to do. Continue rinsing. Immediately call a POISON CENTER or doctor / physician. If skin irritation or rash occurs: Get medical advice / attention. Take off contaminated clothing and wash before reuse. Harmful to aquatic life. Dispose of contents / container to an approved waste disposal plant. 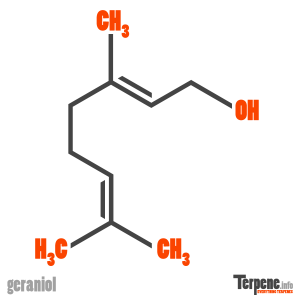 Read through our forum on Geraniol below, or start your own topic. This forum contains 233 topics and 1 reply, and was last updated by enulu 13 hours, 33 minutes ago.